Ivo Daalder, former U.S. ambassador to the NATO, during an event in McCormick Auditorium on Friday. Daalder discussed NATO’s return to its original mission of dealing with the threat of Russia. Ivo Daalder, former U.S. ambassador to NATO, discussed U.S. foreign affairs and said NATO is returning to its original mission of deterring the Russians during an event Friday. “The fundamental raison d’être, the NATO 1.0 reason for NATO existing, is back with a vengeance,” Daalder said. 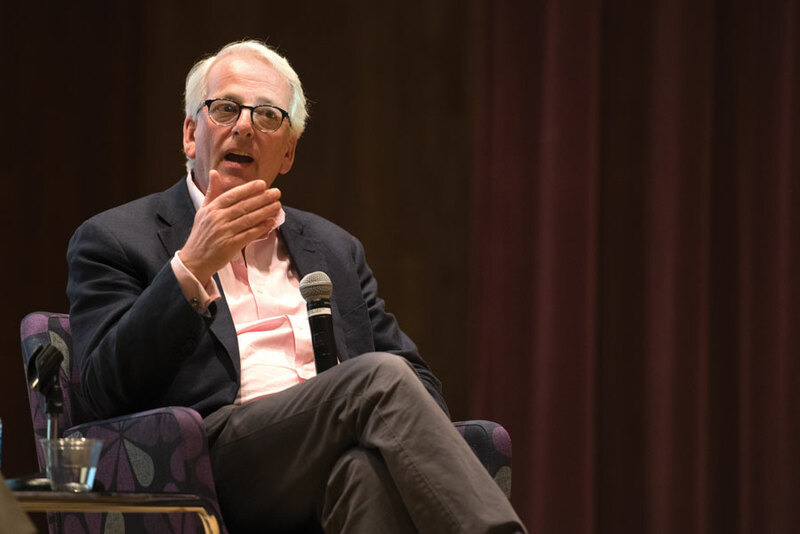 Daalder, who served as ambassador during former President Barack Obama’s first term, spoke to an audience of more than 70 people in McCormick Auditorium about the threat of Russia and the current events surrounding global politics. The conversation, co-hosted by the International Student Association and Political Union, was moderated by international studies and political science Prof. Hendrik Spruyt. Political Union co-president Max Rowe told The Daily his organization invited Daalder because of his leadership experience and proximity to campus. As president of the Chicago Council on Global Affairs, Daalder leads the organization in forming relationships between global cities. “We wanted to provide (students) the opportunity engage with people who are at the highest level of political thought and ask them their questions,” the Weinberg junior told The Daily. Daalder said Russia’s 2014 “invasion” of Crimea mandated a return to NATO’s original mission from the Cold War era. The action sent “shockwaves” through NATO’s leadership, causing it to shift focus away from operations at the time in Turkey and Afghanistan, he said. “The new rationale for NATO is its original rationale, which is to reassure allies and deter the Russians,” he said. Daalder said countries threatened by Russia should increase defense spending for their security rather than because of accusations from President Donald Trump saying they are not paying their “fair share” of funds to the alliance. Currently, member nations are required to contribute a portion of their gross national income to the NATO budget based on a cost-share formula, Daalder said. These countries also agreed to spend at least 2 percent of their gross domestic product on their own defense budgets by 2024, he said. During his time as ambassador, Daalder said he encouraged European countries to increase defense spending to secure strong allies. He said though countries have fallen short of the 2 percent target, they reaffirmed their commitment to achieving that goal during the 2014 Wales Summit of NATO members. In addition to strengthening alliances to deter Russia, Daalder also discussed how the “impacts of globalization have been distributed unequally,” causing a “realignment” in global politics. Because leftist parties weren’t able to help those negatively affected by globalization, new populist political movements have emerged, he said, which resulted in instances such as Brexit and Trump winning the U.S. presidential election. McCormick senior Jonathan Hoffman told The Daily he attended the event because the issues discussed were universal.